Sunrise Games and Comics opened in El Paso, Texas, in 1979. Since 1990, it has been run by the original owner’s sister, Cora Garcia known locally as Ms Cora. But at 81 years old, she’s decided enough is enough. She told the local news service that this is down to her health and needing more help to do the job than she can get. 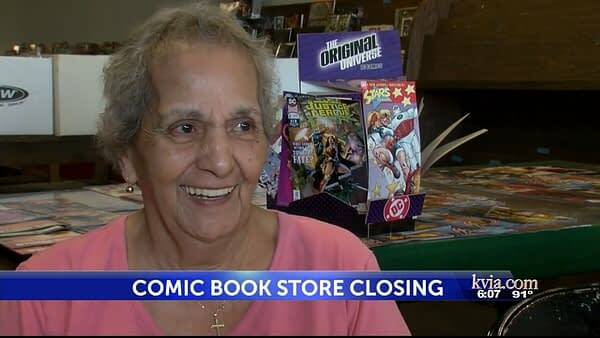 Popular with the local Fort Bliss soldiers, she talked about keeping the Darth Vader action figure given to her by a soldier who died in Afghanistan, when the store closes. And she sent out a message of thanks to her customers. “I just want to thank everybody who came in this place and made my day. I thank them from the bottom of my heart,” Garcia said. Sunrise Games and Comics closed on August 31st.